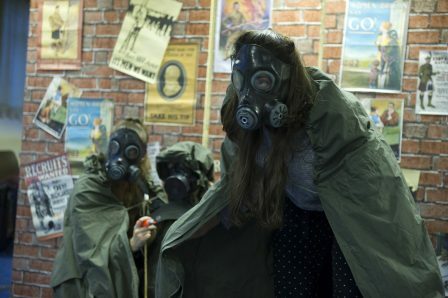 As our schools tour productions enter their second week, we catch-up with Ant Stones, director of Macbeth. What appeals to you about the play? The Macbeths are the heart of the play and their relationship is one of the most intriguing in history. We’ve studied the play with thousands of students, actors and creatives, yet everyone has a different opinion on where the power lies. Throw the witches and their prophecies into the mix and it gets even more complicated. Every production must make their own choices as to who is to blame for the play’s tragic end. Is it a powerful woman bullying her husband? Does the mighty warrior-Thane know exactly what he’s doing from the start, or is everyone the victim to otherworldly evil? When did you decide to set the play? We chose to set the play in an alternate version of history, inspired by the 1930s and the ‘Year of Three Kings’. The play’s events take place in a very short space of time and affects a whole nation. As Macbeth descends into madness, his country turns against him and we used the media of the time (newspapers and radio) to highlight the impact of Macbeth’s actions on his subjects. The witches are based on protesters of the time, allowing us to explore the play’s anti-establishment themes further, while hinting at their ulterior motives. The witches are fascinating characters, as they flirt between the real world and the supernatural. Hiding them behind their masks allowed us to keep them at arm’s length and retain a level of mystery. Are there real people beneath their masks, or are they an embodiment of an unnatural and evil power? How did you find adapting the Script? Cutting Macbeth to an hour leaves you with an intensely-focused version of the story. As the full play revolves around the Macbeths, with no real sub-plot to speak of, you lose less nuance and detail than you might in Shakespeare’s other works. To counteract the limited time for the secondary characters, it’s important to maintain their important scenes. During rehearsals, we discovered that it’s essential for Macduff and Malcolm’s story that they’re both present to hear of the attack of Macduff’s home. This becomes the catalyst for their revenge and allows the audience a moment to crown them as our undoubted heroes. The idea of the seen and unseen, reality versus fiction, is important in the play. Macbeth sees things that no one else can. Lady Macbeth enters her own world of dreams (or nightmares). She never sees the witches, only hear of them through reports and her death is kept off stage. Cutting the play allowed us to explore it with some bold choices, such as keeping the ghost off stage and withholding the death of Banquo from the audience, mirroring Lady Macbeth’s ignorance of her husband’s plan.